An August Oceanscape. 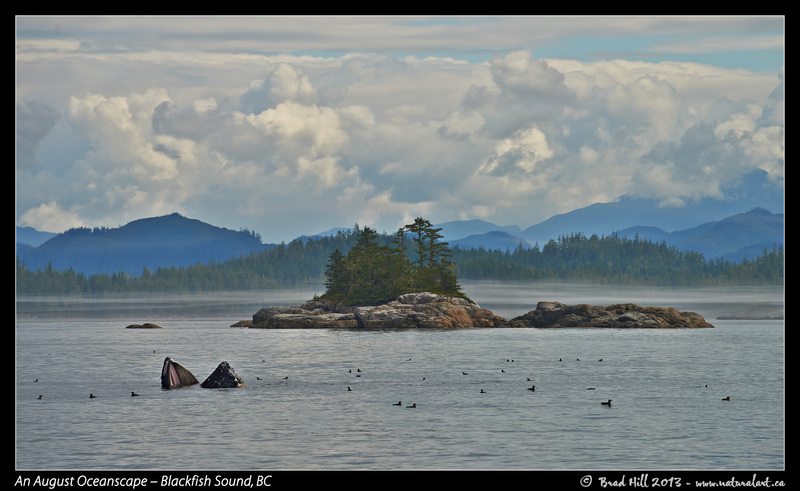 Blackfish Sound (northern Vancouver Island, BC). August 19, 2013. I captured this expansive animalscape* on a misty, moody morning in August of 2013 while on my annual "Humpbacks, Orcas, Sea Lions and More" photo tour. I went on this trip with a bit of a different mindset than normal - I was determined to resist the urge of almost all wildlife photographers to always "get closer". So I intentionally made myself "back off" (at least in focal length) and shoot more animalscape shots. This was partly because I went on the trip wanting to do more testing of Nikon's top pixel monster of the day (the D800e) - a camera with tons of resolution and, just as importantly, a super-wide dynamic range. In other words, I finally had a Nikon camera in my hands that - if carefully used - could do justice to animalscape and landscape shots. My urge to shoot more 'scapes on this trip was also a result of past history - I knew the area we were visiting had very abundant wildlife and they often situated themselves in front of jaw-dropping natural backdrops (as long as you have a capable and photography-friendly skipper expertly positioning your craft - thanks a bunch Chris!). As anyone who has tried to shoot animalscape shots knows, a lot of factors have to come together for the shots to really work. I know of no other region that so regularly delivers up all the factors needed for great animalscapes. We intentionally sought out this location on this morning. We knew the small rocky islands were often blanketed with soft mist - and we also knew that the amount of feed in the water often attracted Humpback Whales (and a lot of seabirds that also keyed in on the feed). What we hadn't counted on was encountering a humpback that had developed its own laid-back way of feeding. For those that don't know, humpbacks are filter-feeders that often capture their small prey by lunging at the surface of the ocean - an activity that is dramatic and must consume a whole lot of energy. This whale, in contrast, utilized the new and improved method of feeding known as the "lollygag" technique - it simply floated vertically with its mouth wide open and passively drifted around. Now I don't know how successful this new-fangled fishing technique was, but I can attest to the fact that the whale didn't waste a whole lot of energy in trying it out (and...who knows - maybe this whale was just bagging a few Z's and figured he/she might as well try to nab a snack along the way!). What I do know is that this "lazy" behaviour on the part of the humpback sure did make it a whole lot easier to compose the image than if it was doing "normal" lunge feeding! 3. This image was captured during my "Humpback, Orcas, Sea Lions & More" photo tour in August of 2013. Each year I offer trips into two different parts of the Great Bear Rainforest as well as one to photograph aquatic mammals and oceanscapes near the northern tip of Vancouver Island. And, in selected years, I also offer photo tours to locations to capture other highly sought-after subjects, such as various owl species of the boreal forest and wildlife of Canada's Arctic. Details about these trips can be found on the Photo Tours page of this website. Nikon D800e paired with Nikkor 70-200mm f4 VR lens at 185mm. Hand-held from floating sailboat. VR on and in normal mode. 1/400s @ f18; No compensation from matrix-metered exposure setting. Further digital corrections on resulting 16-bit TIFF files using Adobe's Photoshop CC and Light Craft's LightZone. Photoshop adjustments included compositing/blending of the three exposure variants, very minor colour tweaks (hue rotation and desaturation of selected colours), further selective exposure tweaks and selective contrast adjustment, and selective sharpening for web output. Final tone tweaking performed using tonemapper/re-light tool in LightZone.